This is going to be more of a picture post, since the pictures speak for themselves! 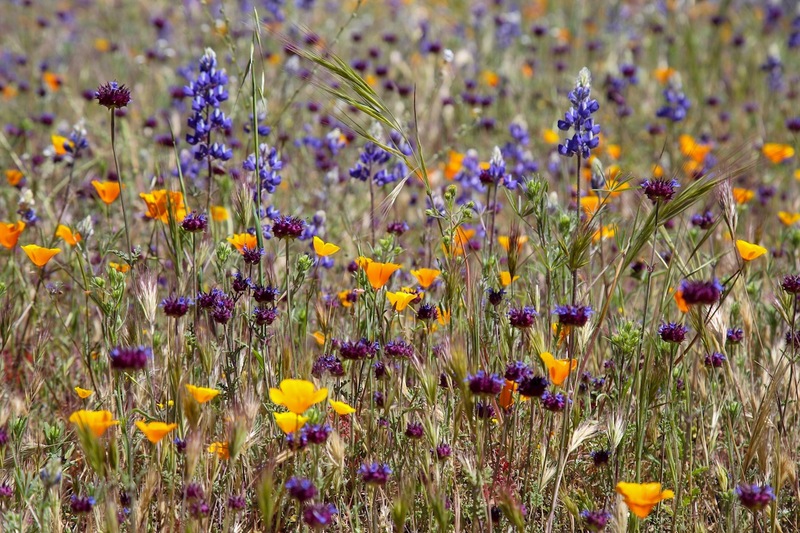 We were lucky enough to experience another superbloom this year. We’ve been away so many weekends in a row and thought we missed the flowers, but they are still going strong, one week into April. 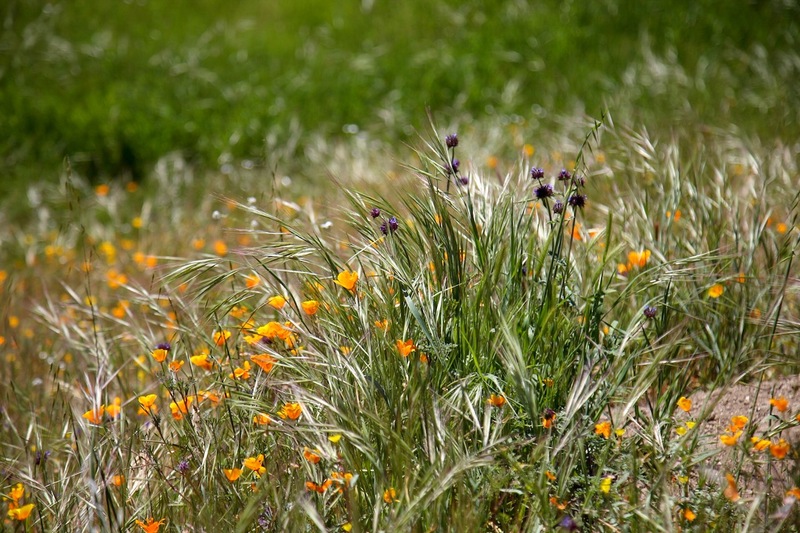 Nothing feels more like spring than vibrant flowers blanketing a bright green hillside. 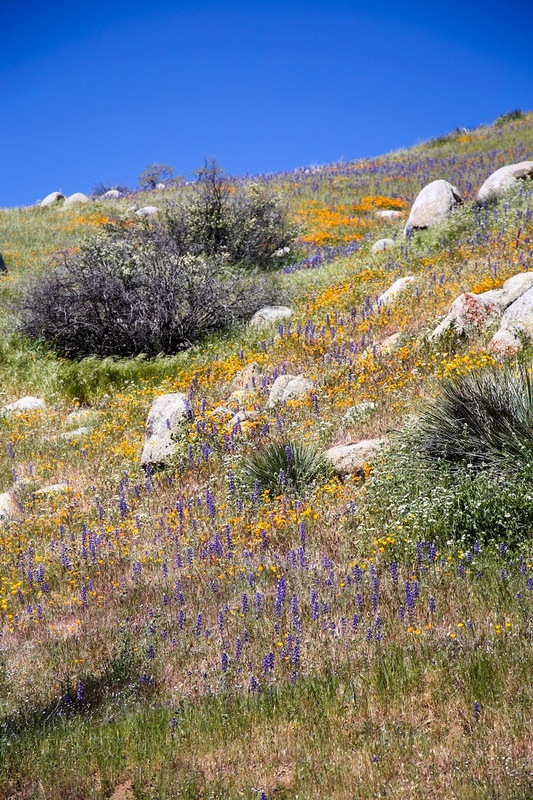 For our hike yesterday, we decided to stay away from the Antelope Valley Poppy Reserve (far too crazy on a Sunday) and instead headed to the Kern River Canyon in Sequoia National Forest. 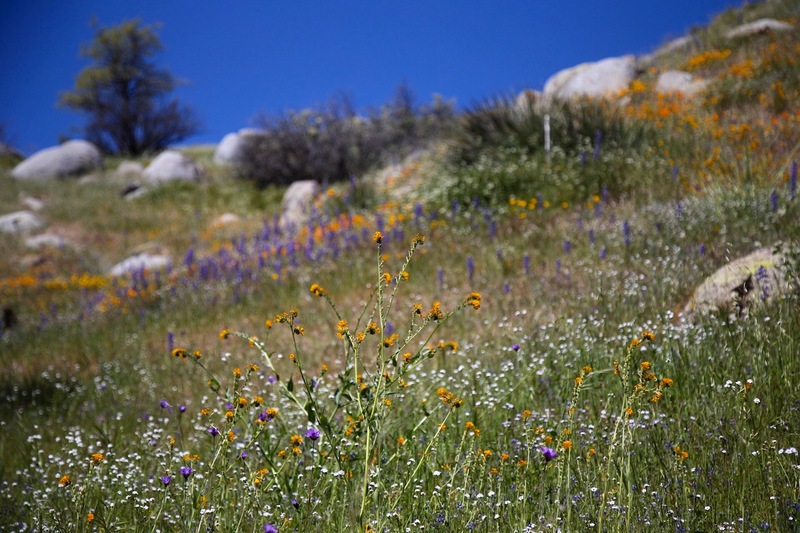 Ryan and I have hiked here once before, years ago, but not during the spring, and definitely not when the flowers were in bloom. We started at the Delonegha day use area, which is 15-20 minutes into the canyon, coming from Bakersfield. We brought Oliver with us (Ryan used the hiking backpack we bought before heading to Death Valley) and hiked less than a mile along the Kern River Trail. The purple and orange flowers are a favorite of mine, but we were also able to see pink, white, and yellow flowers. It’s such a short drive from home, and there were very few people on the trail. 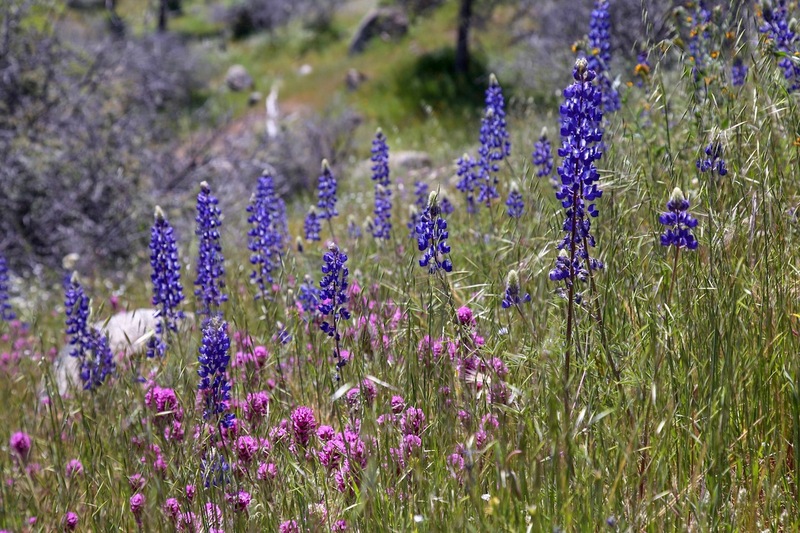 It’s definitely the place to go to see the flowers if you want to stay away from the crowds (highly recommended on the weekend, since the Poppy Reserve is very popular with LA and Central Valley crowds). It’s been a few years since our last stay in Carmel, so on our drive over, I started looking up the wine tasting rooms in town. I saw many mentions of the wine passport or wine walk, so I looked into it and we decided to buy it to see if it was worth the hype. I wasn’t exactly sure how it worked, but figured that since we would be visiting a lot of tasting rooms (all walkable, which is a huge plus), we would get some value from the passport. Was it worth it? For us, no. For some people, maybe. There are 13 wineries that participate and we only really visited 6 of them (although one has a shared room with a winery we tasted at, so we had wines from 7 of them, and one I just went in to check out so I know how it’s set up). For the most part, there is no discount if you have the wine walk cards, but I’ll get into the specifics at each tasting room (that we went to). The wine walk passports can be purchased at the Visitor Center at Carmel Valley Plaza (if you enter on the Ocean Avenue side, it’s on that same level). The cost is $100 and it can be shared – you’re given 10 separate “wine walk cards” so you could even split it between 10 people at one winery. With the passport you get one 10% coupon that can be used at any of the wineries. This alone could make it worth it. Although we bought wine, we didn’t use the card yet, but I plan to use it in the future. Which brings me to the next detail – these cards don’t ever expire! I’m just hoping I don’t lose our leftover cards before our next trip! This was our first stop after purchasing the wine passport. Unfortunately, they are not one of the 13 participating wineries (oops!). They just opened the day before, so they very well could be added to the wine walk passport in the future. The tasting fee was $20, so Ryan and I split it and tasted two chardonnays and three Pinot Noirs. The wines ranged from $25-$50 (but the $25 Chardonnay and the $30 Pinot Noir were not nearly as good as the more expensive bottles). There was also a tasting for members only, which included a GSM. They happened to have that bottle open, so we got to try it. It was our favorite wine, so we bought two bottles. It wasn’t cheap ($45 each), but I wanted at least one, and with the purchase of two bottles the tasting fee is waived, so the second bottle was really only an additional $25. The tasting room was beautiful and comfortable, and I’d definitely visit again! Next door to the Cheese Shop, Wrath has three different tasting menus in addition to a cheese and cracker platter. The standard tasting was $10 and had three wines (Sauvignon Blanc, Chardonnay, and Pinot Noir), which is what the wine passport cards covered this tasting. The other two tastings were each $20 and had five wines to taste, and I would have much preferred one of those. We were not offered the option to use our cards and pay the difference, but I also didn’t ask because I didn’t realize that would be an option. So in this case, the wine passport doesn’t save any money – each card is worth $10, and the standard tasting was $10. In fact, we only used one card because we bought a bottle of the Sauvignon Blanc (only $19) and waived one of our tasting fees. I do highly recommend the cheese platter, which features three cheeses (purchased from the cheese shop next door). If you like sparkling wines, make sure you stop at Caraccioli! The tasting here costs $20, so this is where the wine card might work in your favor. Instead of paying $20 for six wines, the card gets you three tastes. Since there isn’t an option to only pay $10 for a tasting, this allows you to get a sampling of what Caraccioli offers (including the Brut Cuveé, a Chardonnay, and a Pinot Noir) without paying $20 to taste. I didn’t want to miss out on the rosé or the extra Chardonnay and Pinot, so we were offered the option to use the cards and pay $10 to taste them all. Caraccioli also had a Library Tasting for $15, which has the 2007 Brut Cuveé (the one on the standard tasting list is 2010) and the 2007 Brut Rosé. The cards cannot be used toward the Library Tasting, but if you’re a fan of bubbly like me, this is a must! We didn’t buy anything because our favorite wines were all quite pricey, but I think I’ll plan to use my 10% off coupon here the next time we visit, and get a couple of bottles of the sparkling wine. We visited Caraccioli not long after breakfast, so we skipped on the food, but they do sell a cheese and charcuterie plate, as well as a few other small bites. Shale Canyon was my favorite of the tastings we did in Carmel. They share a room with Blair Estate, and they trade off each week manning the tasting room. We had the pleasure of learning about both wineries from Jake, who is one of the owners of Shale Canyon. We were told that we could use our cards to taste either the Shale Canyon wines or the Blair Estate wines, and we both chose Shale Canyon because we wanted to take a break from the Chardonnays and Pinots for a minute. It was a very relaxed and personalized tasting experience, and we ended up being able to taste a couple of wines that interested us from the Blair wine tasting list as well. Some of the highlights for us included the Shale Canyon Mourvedre, Tempranillo, and Malbec. We bought several bottles of wine, and Jake waived our tasting fees, which means we didn’t have to use a wine passport card. We will definitely be visiting the tasting room on our next visit to Carmel! Galante’s western-themed tasting room definitely has a fun and lively vibe. That being said, it wasn’t one of my favorites, but I may be biased for a few reasons: (1) it was our last stop on a long, hot day, (2) it was overly crowded [and we had a sleeping baby in a stroller – who didn’t wake up! ], (3) there were dogs in the tasting room, and (4) I just didn’t love the wine. The wine passport might make some sense here, but ended up being a wash for us, since I splurged and added an extra wine. Their normal tasting menu is $15 for a taste of 5 wines – all 4 from the top portion of their list (a 50/50 Malbec and Merlot blend, a Malbec, a Bourdeaux blend, and a Cabernet Sauvignon) and 1 from the reserve tasting list (two Cabs and the “Grand Champion” – a blend of Cabernet Sauvignon, Malbec, and Petite Syrah). You could add additional tastings for $5, so for $25 you could taste all 7 wines. With the wine passport, we were able to taste all four wines from the top portion of the list, and I ended up paying an extra $5 to try the Grand Champion, since I didn’t love any of the first few wines. The Grand Champion was definitely the best of the bunch, but still didn’t compare to some of my other favorites from earlier in the day. They also have wines available by the glass (prices vary) and a cheese plate for $12. Scheid’s tasting room is clean and bright, and definitely a good place to start the day. It has a more sophisticated vibe than many of the other rooms, so I wouldn’t want to show up here at the end of a long day of tasting! This is another tasting room where it didn’t make a difference to us whether we used the passport card or not – their standard tasting is $10 for 4 wines (so you can use the card in lieu of paying $10), and you can choose from a list of 8 (half white and half red). They also have a Claret Reserve and a sparkling wine, each for an additional $5. So we did one of these tastings, plus I added the sparkling wine, because I can’t resist. They also have a reserve tasting for $25 – not covered by the wine passport, but we got one of these as well. It included three Pinot Noir and the aforementioned Claret Reserve. We very much enjoyed the wines. They also waive the tasting fee if you purchase two bottles, which is always a nice bonus. Finally – a tasting room that actually gave us a reason to use our wine passport cards! The normal tasting is $15 for 4 wines (Rosé, Chardonnay, Pinot Noir, and Barbera). With the wine passport, we were able to taste the first 3 wines (remember that each card is essentially worth $10), plus we could add the Barbera for $3! We added the Barbera (which was well worth it – definitely the best wine they had! ), so we tasted all 4 wines while we learned a bit about the owner – Alan Silvestri. He’s a composer and has scored over 100 films. They had a list available, so it was fun to look through and count the movies we had seen. I was debating whether I should do one more tasting before we left on Monday afternoon. I popped into Manzoni to see what they were pouring (Chardonnay and Pinot Noir, but also Syrah, and they usually have a Rosé, but they were out of it). Their normal deal is $10 for 4 tastes (they had six wines to choose from normally, but they only had 5 since they were out of the Rosé), and you could pay $2.50 to taste additional wines ($12.50 for 5 or $15 for 6). With the wine passport pass, you could taste 3 wines, so it’s not a good deal…for anyone! I didn’t really need another tasting, so I left without trying their wines (if we do visit again and decide to taste here, we will definitely be paying for a tasting and not wasting one of the wine passport cards). Overall the wine passport was NOT a good deal for us. There were a few wineries that actually gave it some purpose, but for the most part we would have gotten the same deal if we had just walked in and paid. However, the 10% off coupon could be a tie-breaker, especially if you use it on a larger wine purchase (I’m not sure if there’s a limit or not). I wouldn’t recommend the passport to any of my friends, since it’s a big commitment to use all of them (we visited 6-7 participating wineries and we both tasted at most of them, and we still didn’t use them all), and if you are more than a very casual wine taster, you’ll likely be enticed by some of the premium tastings, which aren’t covered by the wine passport. Note: we did not visit Dawn’s Dream Winery, De Tierra Vineyards, Winery Oaks, Smith Family Wines, or Carmel Road, so I’m not sure what their wine passport deals are. We do have three wine passport cards left (after our mix of either using two cards, sharing one tasting, or paying for the tasting ourselves), so maybe we’ll check a few of these out the next time we visit Carmel! Thanks to my gold status with Starwood and the recent merger between Starwood and Marriott, I am now have Gold Elite status with Marriott. I’m not exactly sure what triggered the deal for me, but I’m assuming that has a lot to do with it. 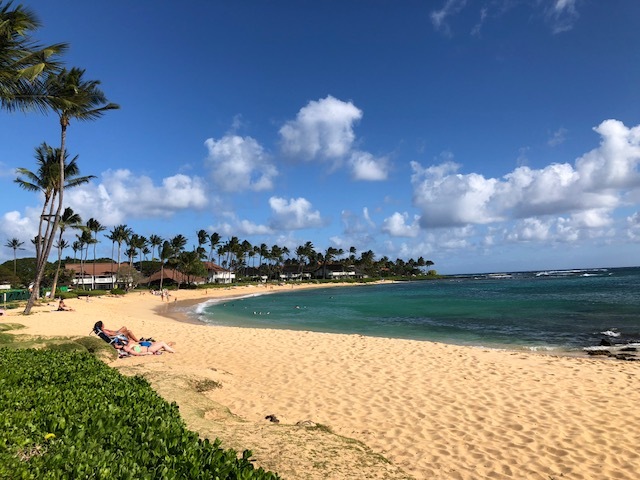 While the conversation with the salesman (and his manager) was more than 30 minutes, the short story is that I was offered another $799, 5-night deal to a nice hotel, similar to the Starwood deal we booked last October. We had to decide on the call whether or not we would take this deal. Luckily sales people like to talk, and I was able to stall long enough to make sure Ryan was on board (since he was at work – I had to wait for a text back!). This also means that I didn’t have time to google the legitimacy of the deal and had to go with my gut (which said to book it). There are no blackout dates; although I’m still not sure if this means that there is unlimited availability each day. So, we’ll have to decide on our dates soon so that we can lock them in. Luckily we shouldn’t be as inflexible as we were for the babymoon. 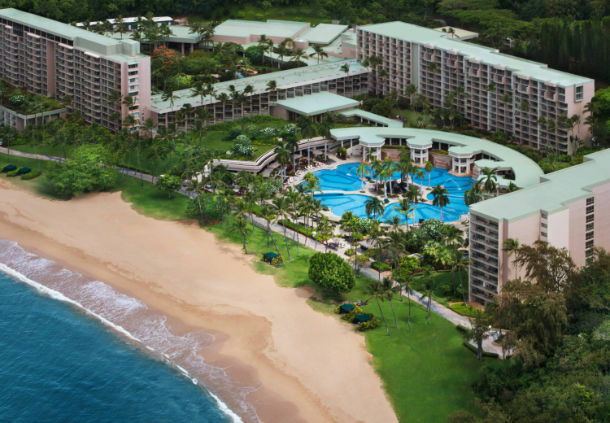 The deal is for more than just the property in Kauai. That’s what we’re interested, but I’ve been told that my $149 deposit can actually be used at a different property. The $799 does not include a rental car, so we’ll have to pick up that tab on our own. Since we’d have to do this with or without this deal, it doesn’t seem like an issue to rent a car on our own. Both of us HAVE to attend the timeshare presentation, otherwise we risk having to pay retail price for our vacation, which is not something I’m interested in doing. 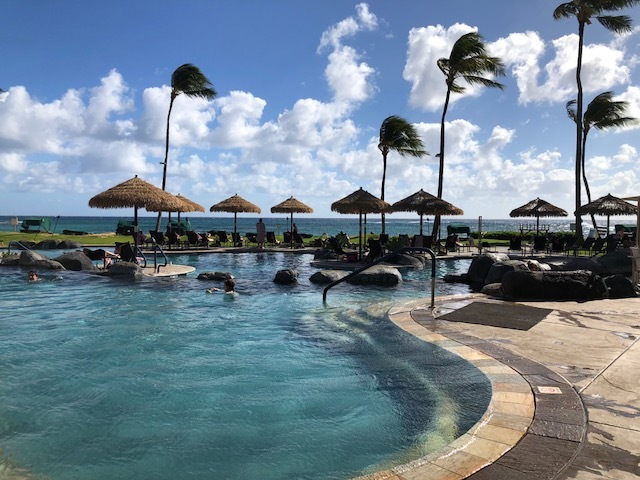 We were able to ditch out on the presentation at the Westin Villas in Maui, so I guess we won’t be as lucky this time around. We hope to book in the next couple of months (I believe I have to book at least 60 days in advance of when we plan to travel), so hopefully there aren’t any surprises. I’m planning to go back to work at the end of January, so the current plan is to go just before I return. One last getaway before work life begins again! After we had booked our flight to Argentina, I was researching things to do and found out about this Full Moon Walk that is offered 5 nights a month (two days before, day of, and two days after the full moon). I was nervous to check the timing for October, but was pleasantly surprised to find that our trip fell within the window for the night visit! I used this site to get information on the dates, cost, and times for the tour. I sent an email to make a reservation and was sent three attachments – two info sheets (one in Spanish and one in English) and a booking form, which was only in Spanish. Here’s the general info for the walk – it’s $500 pesos for the walk, plus $200 if you want to add dinner at La Selva, the restaurant in the park. Transportation is not included in that cost. There are three walks per night – one at 7:45pm, one at 8:30pm, and one at 9:15pm. If you decide to add the dinner and you choose the earliest time, dinner has to be after the walk. If you choose the middle time, you can eat either before or after, and if you choose the latest time, you have to eat dinner before the walk. We chose to go with the middle time, and to eat dinner (after the walk – although we didn’t have to specify on the form). Once I sent off the completed form, they charged my credit card, and I didn’t deal with the company at all until the day of the walk. For transportation, I contacted our hotel, since we were staying in the park. I didn’t know at the time, but the Sheraton isn’t actually at the main entrance. In fact, we never went to the main entrance during our park visits. So we arranged to have a taxi bring us to the front (it took just a few minutes) and also pick us up after the walk + dinner. It seemed that most people, even those staying in Puerto Iguazú, arranged for a taxi ride. We got to the main entrance a bit before 8:30pm (the tour start time). We didn’t have a voucher (I think if you book the trip while you’re there, in the park, you can pick up an actual voucher). But our names were on the list, and we were brought in front of a shop to get our vouchers for the tour and for dinner. There were a few stores still open, so we browsed while we waited for the tour to start. Nothing happened until 9pm, when they gathered everyone around and explained a bit about the park (there was a Spanish and English group). The group was about 100 people large, and we finally piled into the train around 9:20pm. The walk to the falls was very peaceful. We had just done the walk that afternoon, but for some people on the tour it would be their first time seeing the falls. The Garganta de Diablo was magical at night. The pictures don’t do it justice. The waterfalls were flowing at a tremendous rate, so sometimes the mist would almost completely cover the falling water. We were so lucky that we had such a clear night. 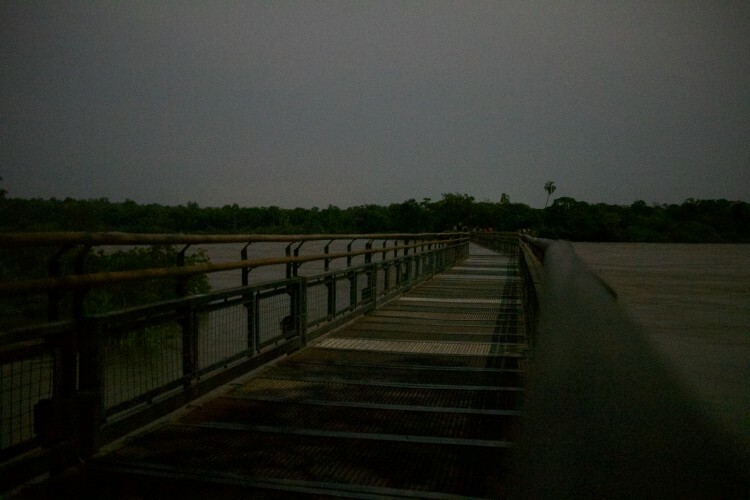 In fact, they will cancel the walk if it’s too cloudy, since there are no lights to guide you other than the moon. We had about 25-30 minutes at the actual platform (it takes maybe 15 minutes to walk out there), and there were no issues getting great views from all angles, even with 100 people. I’m so glad I found out about that walk, and that it worked with the timing of our trip. I chose the first available night (the second night of our trip) in case bad weather caused the walk to be canceled. That way we could potentially rebook for the following night. As I already mentioned, we were ver lucky and had a clear night for our visit. Dinner at La Selva was pretty good. Nothing great, but it was a buffet and had a meat station (I didn’t try anything, but Ryan did and enjoyed it). Since we were staying at the Sheraton, I’m glad we ate at La Selva instead of driving into town, but if you’re staying in Puerto Iguazu, I’d opt to do the walk at 7:45 or 8:30 and then head back to town for dinner afterwards, since there are many dining options that are superior to La Selva. I’m so glad this all worked out – I was a bit skeptical since booking the visit seemed a bit too easy, and didn’t require any follow-up. It was a fun way to spend our second night in the park, and a great way to appreciate the falls without as much of a crowd. While I wouldn’t go out of my way to rearrange my trip to plan around the full moon walk, it’s a bonus if you happen to be visiting at the right time! We’re back from our two-week trip to Argentina! We had a wonderful time and can’t wait to share what we loved best. 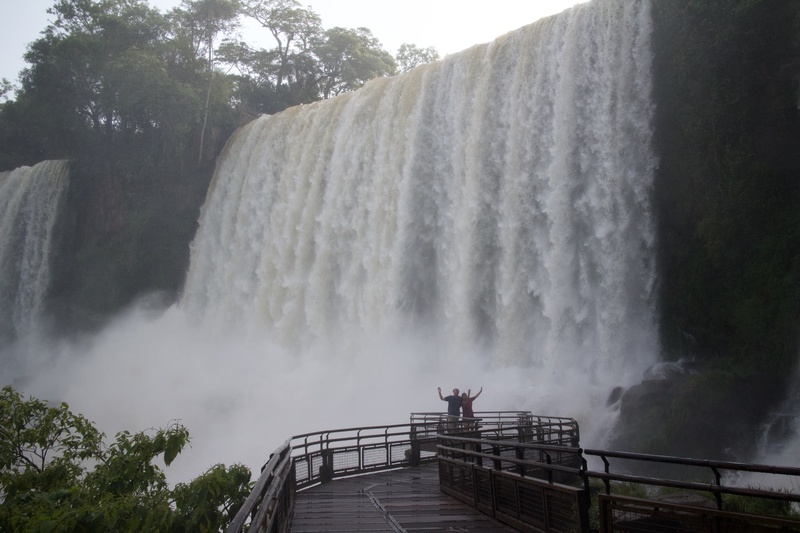 We started our adventure in Iguazú National Park and stayed inside the park at the Sheraton (only hotel in the park in Argentina). This was the only hotel on the trip that there was no debate about – it was a Starwood property that could be booked with points (so it was “free”) and it was inside the park. There was nothing else for us to consider, and we booked it as soon as we booked our flights! A view of the hotel (yes, the exterior is a bit outdated) from the entrance to the park. It was THAT close! Better than we could have imagined. Price. As I mentioned above, we were luckily enough to book our hotel using Starpoints. For this time of year (late October), it was 16k points per night, for a total of 48,000 points. (When we were originally thinking of visiting in early September, the rate was 12k/night.) I’m not sure how much it would have been if we had paid for it, but rooms seems to start around $300 (give or take, depending on the time of year). Location. In the national park! Just a quick walk from our room (5 or so minutes) to the lower circuit trail of the park. We could see (and hear!) the waterfalls from the hotel, and it was amazing. You could also be the first and/or last people in the park. We wandered into the park on our first afternoon, and we were surprised with how empty it was (it was about an hour before closing) and how close we were to the falls! For us it was worth it to stay in the park, but it is about 30 minutes away from the town. We took a taxi a couple of nights to eat dinner in town, which wasn’t a big deal for us. One more logistical note – we had to pay the $260 (pesos) each to enter the park as we were driving in. We had read that by getting your ticket stamped, you can then pay half price for the park entrance the following day (but on the third day, you would pay full price again). 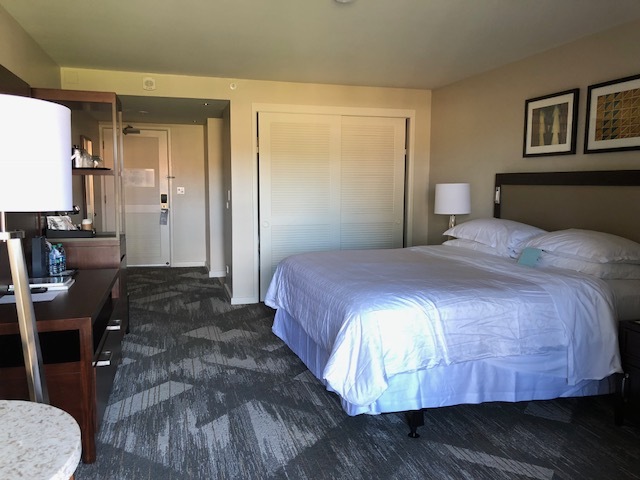 Well, one perk to staying at the Sheraton was that we paid the entrance fee once, and never had to pay again (even though we left the park several times during our stay). This was a surprise for us – we went on a quick walk from the hotel on our first afternoon there, and ended up walking the lower circuit! Room. Since we booked with points, we had the standard room, with a view of the jungle. A few days before the trip, I received an email saying we could upgrade to a falls view room for $50/night. I jumped at the opportunity. As luck would have it, we ended up getting a free upgrade when we got there! Our room was second from the end, so our view of the falls wasn’t that great. But it was still neat to see the mist from the falls and hear the falls! Dining. Honestly, it was a bit subpar. They do have a restaurant that serves lunch and dinner, but we decided to skip it for everything except snacks. The food was just okay, and the service was really lacking. Breakfast was better – it was a buffet with eggs, meats, potatoes, cheeses, fruit, cereal, and an omelette bar. They even had champagne! Breakfast was open from 6:30-10:30, so guests can get a very early start (the park doesn’t open until 8am, though). Amenities. The hotel has a pool (which we used everyday), a gym (which we never used), and a spa (which we tried to use, but it was booked). It really is set up so you don’t have to leave the hotel to go into town for anything. They even had a little gift shop that seemed to sell most things you’d need for your trip. As mentioned above, there is also a bar in the lobby, and a restaurant that serves lunch and dinner. The hotel also serves drinks and food at the pool, but the bar was being repainted while we were there, so it was closed. They did have people taking orders, but the service wasn’t consistent and we were never able to get anything ordered. Transportation. Usually this would go in a city overview, but since we didn’t actually spend much time in the city (Puerto Iguazú) and I won’t be writing a city overview, I’ve added it here. For the Argentine side of the park, there is no transportation needed. You walk to the start of the lower circuit and upper circuit trails, and to get to the Garganta del Diablo (Devil’s Throat), you take the free train that runs in the park. For everything else, we used taxis arranged by the hotel – to go to the Brazilian side, to go to dinner in town (25-30 minute drive), to go to the front entrance of the park for the Full Moon Walk, and to get to the airport. This was so smooth – the hotel has their own taxi service, so we were able to get a taxi at a moment’s notice. Even to cross the border and go into Brazil! And in all cases (other than getting dropped off at the airport), it was arranged so we had a roundtrip ride. All rides were paid in Argentine pesos. While the hotel wasn’t perfect, it was great for our stay! I would definitely plan to stay here on a return trip. 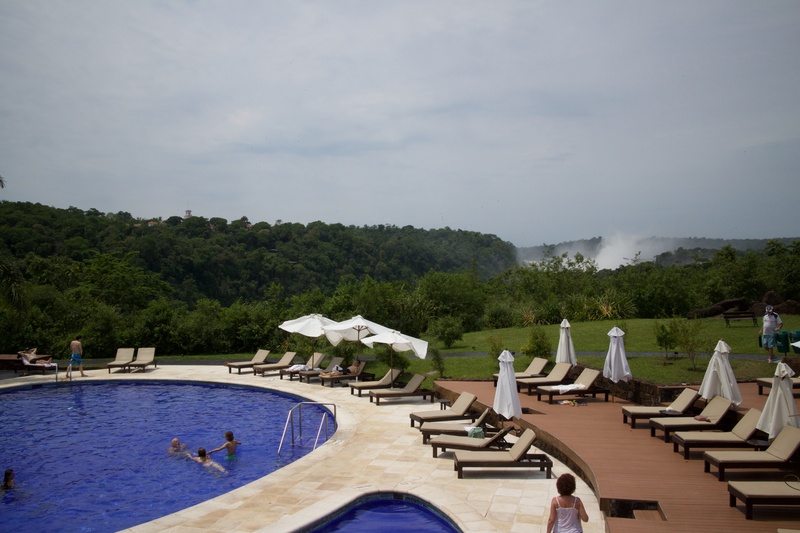 I would also consider staying on the Brazilian side at the hotel inside the park – the Belmond Hotel Das Cataratas. Apparently the rules are a bit relaxed on the Brazilian side, so you can actually enter the park before it opens or after it closes (not the case with the Argentine side). If you are looking for nightlife, it may be best to stay in town – either Puerto Iguazú in Argentina or Foz do Iguaçu in Brazil. Through the grapevine we’ve heard that Foz is better for restaurants and nightlife, but we didn’t even drive through the town, so I can’t really comment on that. 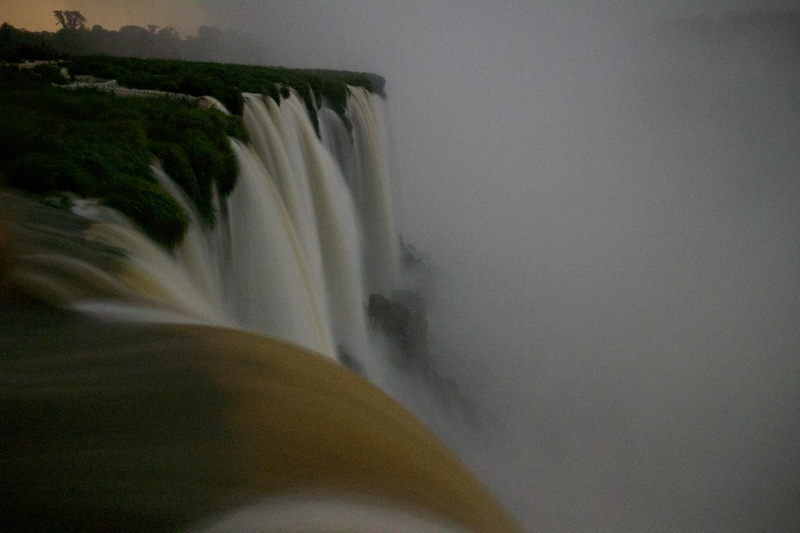 No matter where you stay, Iguazú Falls should be considered for any trip to Argentina (or Brazil)! 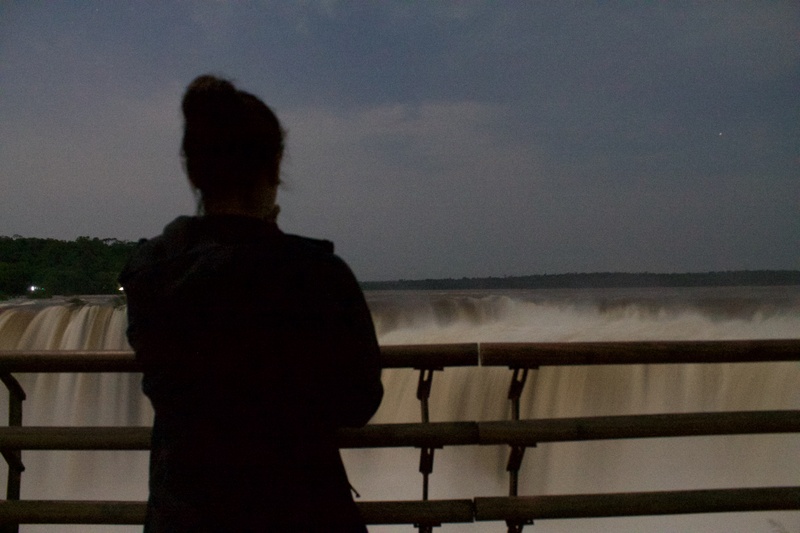 About two months ago I read something online about a full moon walk at Iguazu Falls. It happens once a month, around the full moon (of course! ), which is when we’ll be there! 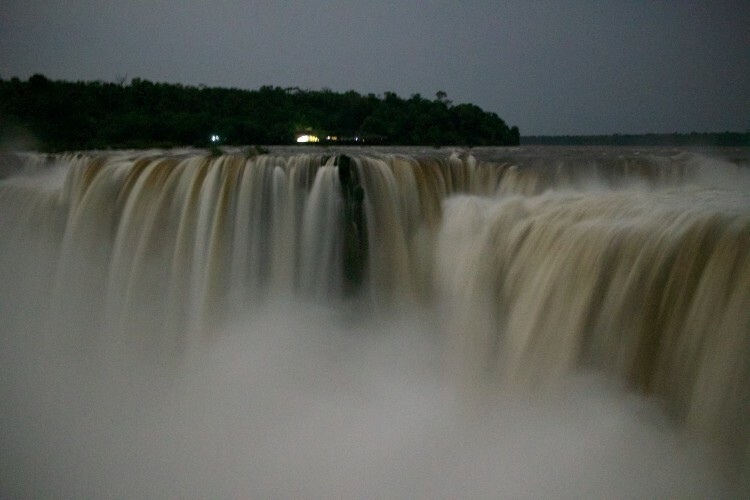 For 5 nights, a company takes 3 tours out to see the falls under the moonlight. We had such a great time when we did our night visit to the Alhambra, so I knew we had to take advantage of this. We booked and got our preferred date and time, and I can’t wait! I’m just crossing my fingers that the weather cooperates. I already talked about our El Calafate activities in my post here, but will mention them again (now that we’ve officially booked). We’ll be taking the mini trekking tour with Hielo y Adventura on our first full day, which includes a trek across a glacier! Our second day will be a bit more relaxing but the views will be stunning – we’ll be on an all-day boat cruise that will allow us to get up close to the glaciers. We ended up booking with Marpatag because the experience looks more luxurious, but there are other (cheaper) options. Nothing booked! We have two long hikes and a few short ones planned, but the days are flexible and there’s nothing to book in advance! We decided to take one day trip (as opposed to two, which just seemed like too much time away from the city) and it was between a visit to an estancia, the Tigre delta, and a day in Colonia del Sacramento (in Uruguay). Ryan found an estancia that offers a day trip (including transportation back and forth) that sounds like a lot of fun. It starts with a tour of the town (San Antinio de Areco) and then a visit to the estancia, with either horseback riding, a carriage ride, or a swim, a barbecue picnic, and a demonstration put on by gauchos! We booked this for the middle of our time I’m Buenos Aires. We plan to tour the Teatro Colón, but thought it would be even more special to see an opera while in town. When we went to buy tickets, we noticed that there was also a concert, so we booked that instead! The performance is in two weeks and we just booked it this morning. Based on what I read online, we either wanted seats in the orchestra or the balcony. I’m not sure if this is the case with all performances, but there were almost no seats left. Luckily between the two of us we were able to navigate through the Spanish-only website and purchase two tickets. The last thing we have booked is a graffiti tour. One of our friends went to Buenos Aires a few years ago and this was his favorite experience of the trip. We booked through Graffitimundo, which has south city and north city tours. However, the tours are only offered certain days, so although we really wanted to fit it in at the beginning of our trip, we’re having to wait until the very end. And there you have it! A quick look at most of our plans for our trip. We have high hopes for everything we’ve booked and for the activities in between. We can’t wait for the adventure to begin! We just returned from our week-long adventure in Japan! We had a wonderful time in Tokyo and Kyoto (despite the sometimes rainy weather), and we can’t wait to write more about the trip! When? 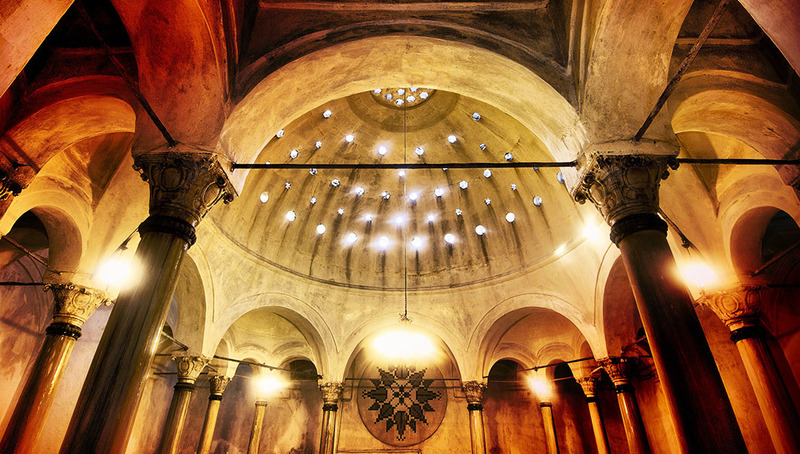 3 nights – September 5-8, 2015. After we booked our plane tickets we found out that it’s the rainy season, and that there may even be a typhoon while we were there. It worked out fine and our plans weren’t ruined, but it was less ideal to have to deal with rain. For our 7-night trip, 3 nights was perfect. That meant two full days in Tokyo, which gave us the opportunity to see our top priorities, while still allowing time for 4 nights in Kyoto. Where? 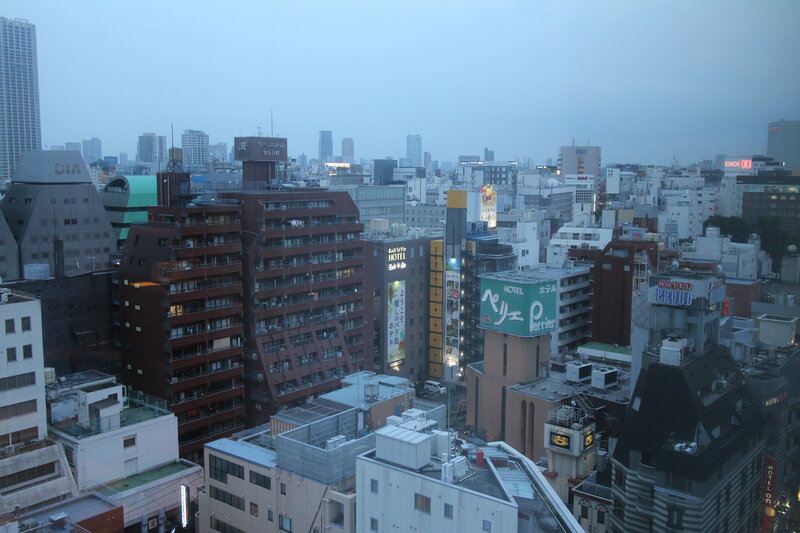 We stayed at the Granbell Shinjuku Hotel, which we loved. 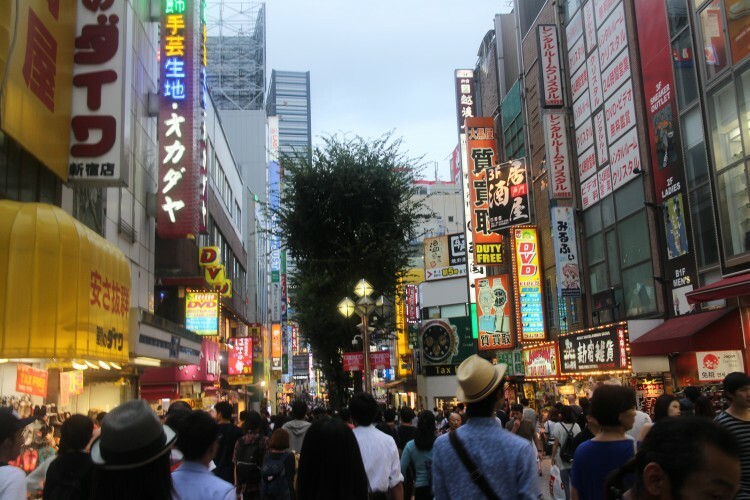 I was worried that the Shinjuku area would be too crowded for me, but we weren’t on any of the main streets – just close enough to be able to walk to shops and restaurants. We aren’t big on the nightlife (and really, we had a horrible time getting adjusted to the time zone), but Shinjuku (particularly east of Shinjuku station), seemed to be lively well into the night. Transportation. We flew direct from LAX to Narita International. We took the Narita Express (a train) from the airport into Tokyo, which took about 90 minutes. From there, we took the Tokyo metro to a station closer to our hotel, and walked from there. We relied on the metro a lot (which was very smooth and easy to use), and only used a taxi on our last day, since it was raining. Ryan will go into more detail about the transportation logistics. Food. Amazing. We had some of the best food in Tokyo – an unforgettable sushi dinner at Sushi Iwa and ramen in the Golden Gai area were the highlights. Everywhere we turned there was a sushi place – serving fresh fish that was caught locally and purchased at the fish market. Even the department stores and train stations had restaurants. It really was amazing, and I wish we had more time in Tokyo just so we could experience more of the food. 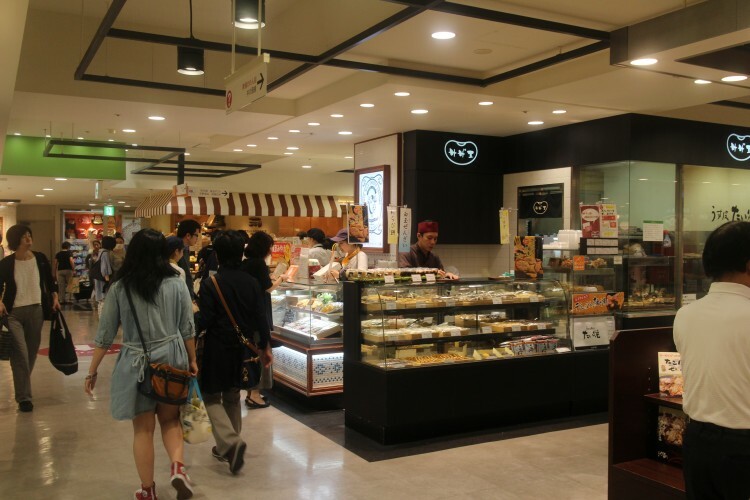 A food court (and grocery store!) in the basement of a department store. Day Trips. None, although we had toyed with the idea of a trip to Hakone, an area known for hot springs and views of Mt. Fuji. Attractions. This city has a lot to offer, and we didn’t even come close to scratching the surface. 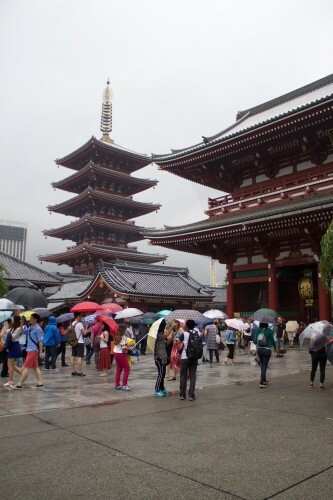 Some of our favorite activities include a visit to Meiji Shrine, Gyoen Shinjuku park, a Kabuki play, and Asakusa (and Senso-Ji, shown to the right). If that doesn’t interest you, there are museums (historical museums like the Edo museum and art museums), several other parks, Tokyo Disneyland, Tokyo Universal Studios, Odaiba (an “island” with attractions to last at least a full day), and so many others. 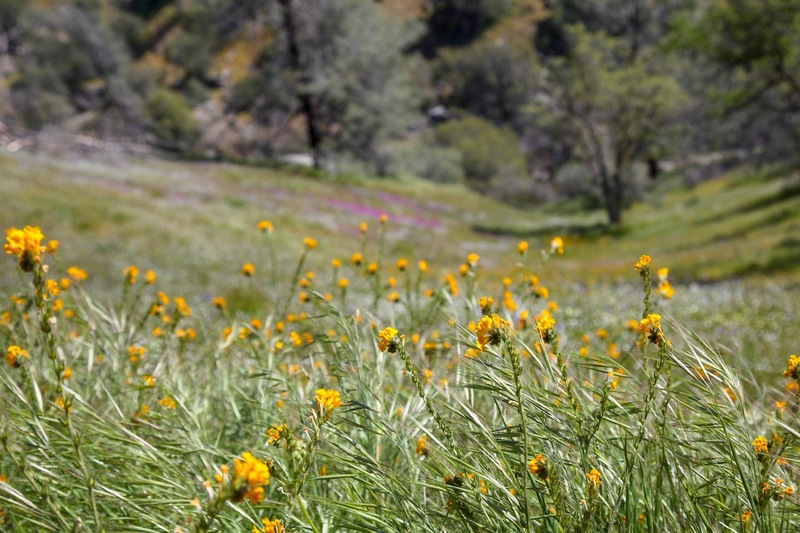 It really is diverse and anyone could find something fun to do during a visit. And there are so many people – visiting, living, wandering – that it can be fun tojust sit and people-watch! Language Barrier. We do not speak any Japanese. The only word either of us used the entire time was “arigato” (thank you). It worried me, but overall it worked out just fine. Some of the people we met spoke English, and some not so much. But everyone was very willing to help, so we never felt frustrated. It’s amazing how much can be communicated through gestures! Cost. I hate to call a city expensive, but Tokyo did feel a bit more expensive than some other cities we’ve visited, at least for hotels. Food can be VERY expensive, but you can also spend $10 and get a bowl of ramen and a beer! 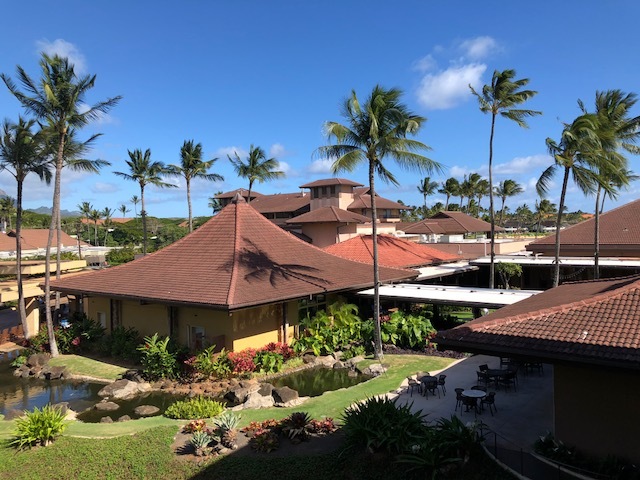 It really does vary, and we did not spend too much money on transportation or visiting attractions, but did decide to splurge (a bit) on our hotel and on our one very nice sushi dinner. Advice. If you want to eat at a specific restaurant (and one that’s popular), plan to make reservations ahead. 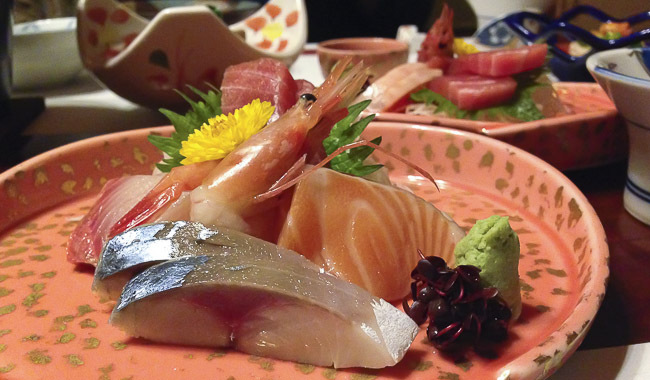 We used the Visa Signature Concierge service for Sushi Iwa, but working with your hotel would be another good option. Some restaurants may take reservations directly, but keep in mind that many restaurants will charge a hefty fee for a missed reservation (this can include being late). So take the reservations seriously, and plan accordingly! Closing comments. Tokyo was a great introduction to East Asia. The city is modern and transportation is easy, everyone we encountered was very friendly, and there’s a lot of different types of attractions to enjoy. And the food is amazing! I think our 3 nights was enough to do what we really wanted, but you can easily spend more time exploring and enjoying this huge city! We left from San Diego and drove across the border on a bus. The border crossing took a while (we all had to have our passports examined and our bags x-rayed; the way back was way quicker, believe it or not! ), but the actual time spent driving was very minimal. 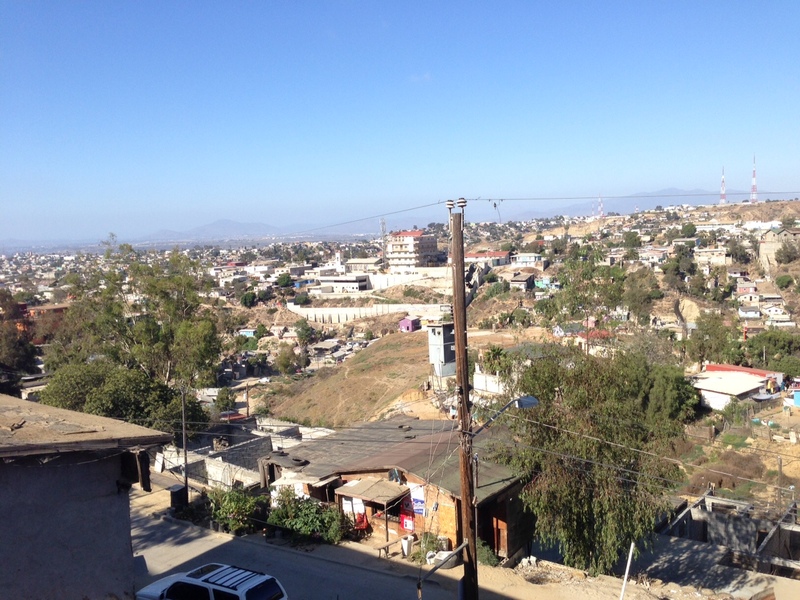 I had never been to Tijuana before or close to the border, so it was a bit shocking to see just how different things were just on the other side. 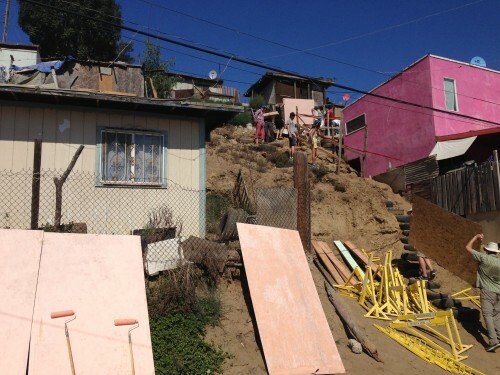 Such a change from the nice San Diego homes and shops – small houses that were mostly falling apart, makeshift stairs and roofs, dirt sidewalks. And a lot of the houses had a view of San Diego – imagine looking over and seeing that million-dollar view, but being just out of reach (pictured on the left is the view from our build site). It was really eye-opening, and I’m glad we had the opportunity to help out a little. I know building one house isn’t changing the world, but it’s a step in the right direction. Almost everyone on our build was a first-timer, so we were warned that there was a chance we wouldn’t finish. The first-time builders thing wouldn’t have been a huge deal, but we also had to deal with a “difficult” build site. Luckily the day wasn’t too warm (a high of about 90 degrees, but most of us were from Bakersfield so we were expecting a lot worse) and we were all prepared with light clothes, hats, sunscreen, and lots of water. We had to walk up stairs made from tires and dirt (pictured on the right side of the picture above). We spent quite a bit of time in a daisy chain, bringing materials up and down the stairs. Much of the initial painting was done in the lower area, with the final exterior and the touch-ups completed once the house was up. Ryan and I both spent the first few hours down below, painting the large plywood pieces and trim (used for trim all over the house, and some interior rails and steps). 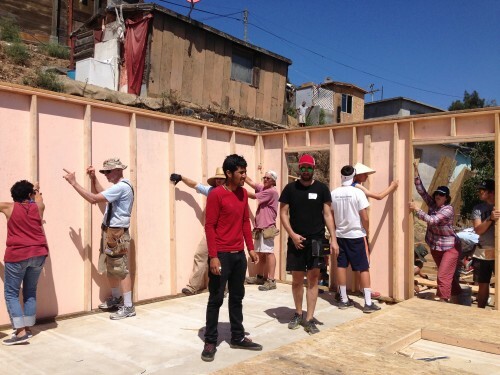 We were called up late in the morning to see the walls go up, which was when it really hit us – this was actually going to be a house! 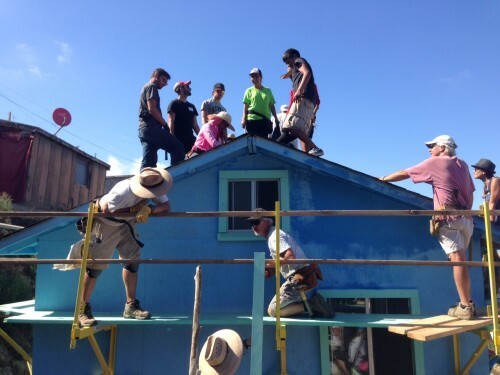 We were on track to finish before the end of the day, but there was still a lot of work ahead of us – putting up the roof (which was first priority after lunch), finishing the interior, putting up walls for the bathroom, and painting the exterior of the house. We took our lunch break around noon, and I was so excited and ready for our rice and beans – Corazón provides the family money to buy ric e and beans and, as a thank you, they cook lunch for us. Imagine my surprise when we were presented with fish tacos topped with pico de gallo, lettuce, chipotle sauce, and salsa verde! The family also had two types of fruit juice and cups with fresh fruit for dessert. Lunch was absolutely delicious, and if I didn’t have a lot of hard work ahead of me, I would have eaten at least two more tacos. The second half of the day was absolutely harder for me. I decided that I actually wanted to use the hammer I brought (and bought specifically for this trip), so I volunteered to get up onto the roof. The roof frame had been built before lunch, but it had to be carried and pulled up onto the top of the house (there were two pieces, to make the A-frame). This is where you really need a lot of people helping. Even once it was up on the roof, there were several people who had to hold up one side, while some of us started nailing it to the top of the house. With at least 15 people on top of the house, both sides of the frame seemed to be stable in no time at all, but there was a lot of extra nailing that had to be done to make sure the roof would stay secure during wind storms. Scaffolding was up all around the house, which allowed us to get around relatively safely. When the team started to nail down the plywood and put down the paper layer (before the shingles), I decided to stay on the scaffolding and work on some exterior painting (very hard work – trying to duck underneath the roof and paint without getting anything in my eyes). 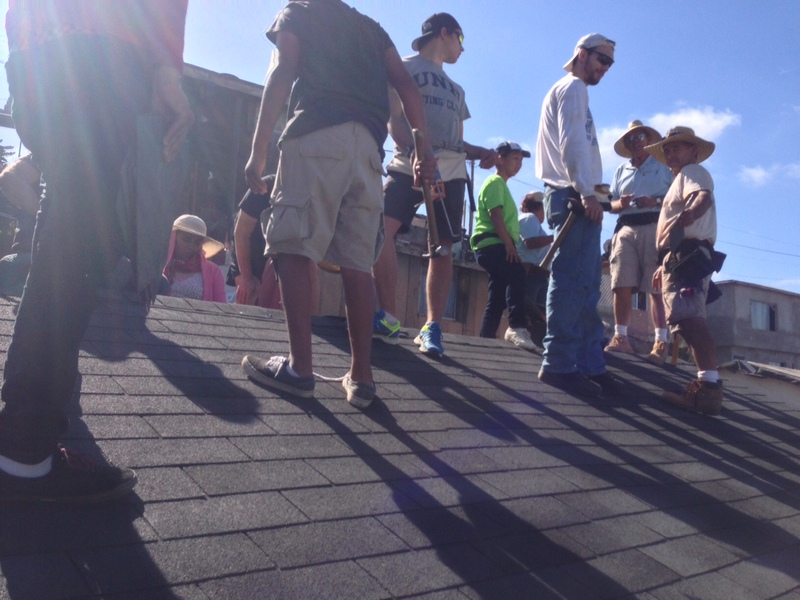 However, I joined them up on top when they started laying down the shingles. The smaller tack-like nails we used for the shingles were much quicker and easier to hammer in than the longer ones used to keep the roof in place. I think the shingles were made out of rubber – the material had a good grip, so I wasn’t worried about slipping off the roof. The only downside is that the sun made them VERY hot to the touch, so I had to be careful not to put my hands or knees down while I nailed. By the time I got down from the roof (at least two hours after I started) the house was really coming together! I was so surprised by the amount of work that had been done to the interior and exterior of the house. From there, it was really just the finishing touches – finishing up the walls of the bathroom, adding the loft to the house, putting the trim on the outside of the house, touching up the exterior paint, etc. 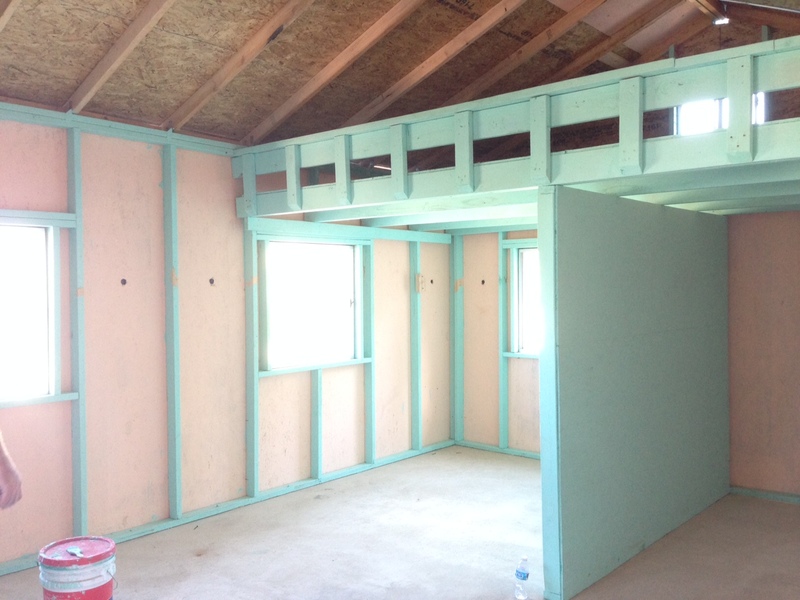 The inside of the house had a loft area, and two small “rooms” separated by the wall pictured above. Not shown is the small kitchen countertop, a storage area on the other side of the house, and the small bathroom. The bathroom would eventually have a toilet, but we were told that the family would not have electricity or running water – the former could be added on, but running water was not part of the future plan. Some houses did have running water. 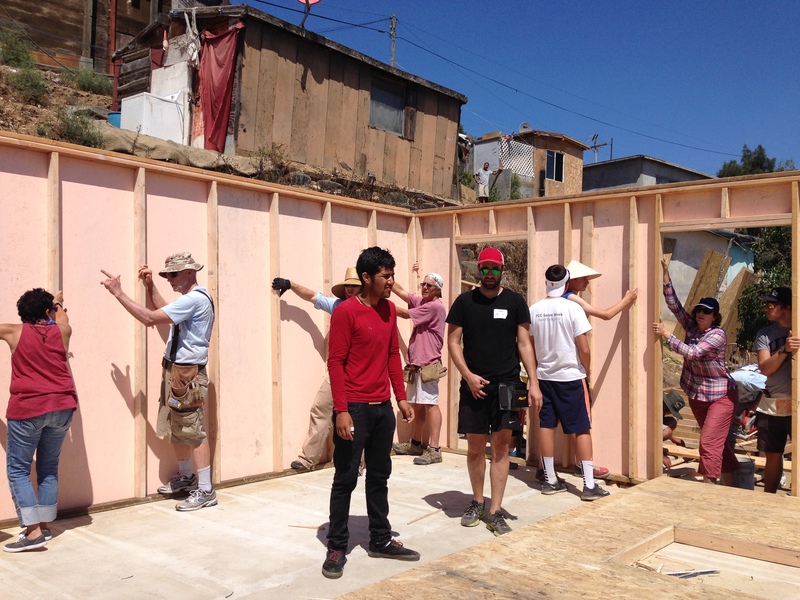 While we were building, we had access to another family’s home for the bathroom – it was very nice with running water and a tub. The family members, some of whom helped us build, were so grateful for their new house. I wish we could have done more to help! It didn’t seem fair that we were about to get back onto the bus, just 8 hours after we arrived, and go back to take a nice warm shower in our fancy downtown San Diego hotel. So, while I felt good about the work we had done, it just doesn’t seem like it was enough. We plan to donate to Corazón because I think they do a lot of good work with the donations (I was sold once I heard about the academics program). We were still smiling at the end of the day, so I think it’s safe to say we would definitely do something like this again! I can’t believe it took me this long to participate in a house build, but it was a great first build experience. We’re going to Argentina! We’ve been wanting to go back to South America ever since we got back from Peru, and we’re finally able to make it happen this year. We’ve booked our flights into and out of Argentina and one of our hotels but other than that, nothing is set in stone. That doesn’t mean we haven’t been thinking and planning, though! We have a very good idea of things to do and places to stay, but just haven’t finalized or booked anything yet. 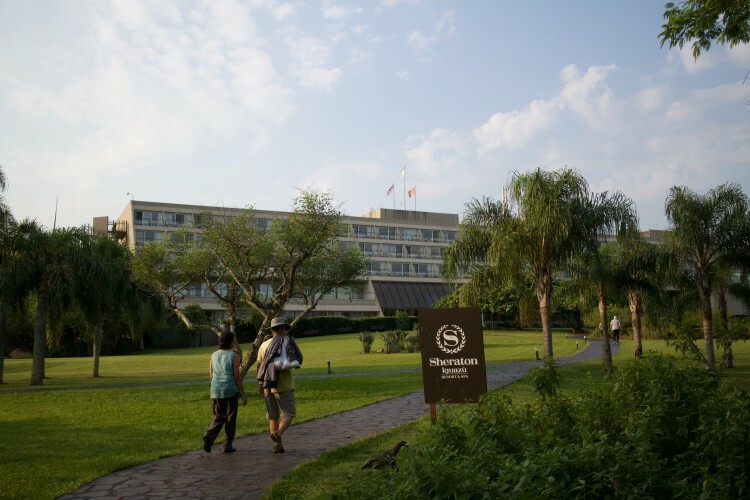 So, we’re starting up north in Iguazú Falls, and I’ve already booked the Sheraton Iguazú Resort & Spa, which is actually inside the national park. It worked out great for us because I was able to book free nights (16,000 starpoints/night), and we will hopefully be some of the first people in the park both days. The rate includes a free buffet breakfast (comparable rate for booking 3-4 months out would be $264-$330 USD, depending on whether you wanted the flexibility to cancel and pay upon arrival). We’ll fly in on a Friday, and spend Saturday on the Brazilian side and Sunday on the Argentine side before flying down to Patagonia on Monday. This picture is from the MarPatag site, which is one of the companies we are considering for the cruise. They have two-night cruise that looks very luxurious and has been tempting us, but right now we’re sticking with the full-day cruise because it’s more practical (and a lot more cost effective). 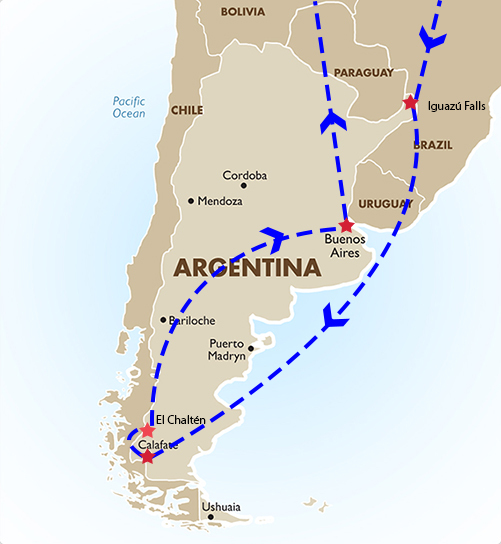 Our last stop will be in (and around) Buenos Aires. Right now we are looking to spend 5 nights there and fly out late on Saturday night. One of my good friends just spent 3 months in South America and she advised us not to spend too much time in Buenos Aires. However, we plan to do a couple of all day side trips, so I’m hoping that we won’t be bored after only 5 days and nights. Plus, our research so far gave us a lot of good ideas for activities to do in Buenos Aires, so I’m confident we’ll enjoy our time here. 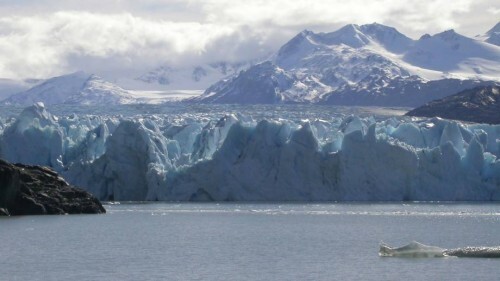 That’s all we have for now – since we do like to plan ahead, I’m sure we will be booking some things (like our activities in El Calafate and any day trips from Buenos Aires), but we’ll try to leave in some flexibility in case we change our minds once we are down there. I’m looking forward to our second trip to South America! Tip: If you want to go to one of the popular ones, be sure to book ahead! We tried to book the morning of our desired visit (looking for a time around 7pm), but they were all booked up. 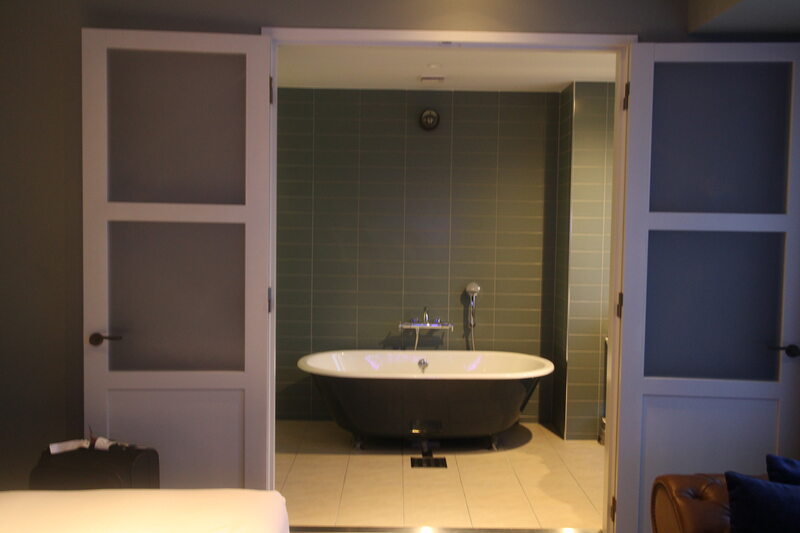 The hotel sent us to another bath – it wasn’t as nice, but the price reflected that so at least we saved some money! First of all, a few logistics. Men and women are in separate areas – at some of the baths, the times for women and men are actually different, so be sure to check on this before you plan! For example, there was one that had men in the morning and evening, and women in the afternoon. This wouldn’t have worked for us because we planned to go at the same time. Women = naked (you don’t HAVE to be, but it’s normal) and men = naked with a towel kept around them at all times. At least this is what we experienced at ours. 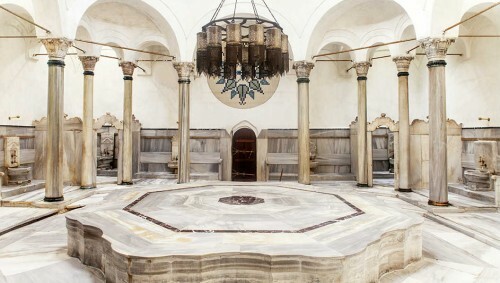 The bath we went to is called Cagaloglu Hamami. It was open to both men and women from 8am – 10pm, and we were told by our hotel that we didn’t need reservations (it wasn’t very busy when we were there – around 6:30pm). They offer a range of services, starting from self-service at €30 (you could also pay in TL or USD, but they did only accept cash – so we had to run to the ATM) all the way to the €110 “Sultan service” – full body scrubbing, a 15-minute dry massage, then a 15-minute foam massage (with two attendants!). 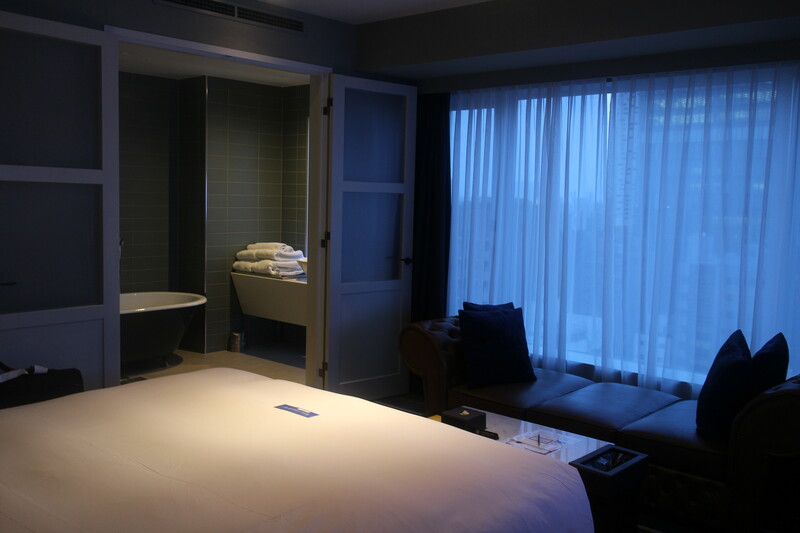 Ryan and I both chose something in between – the “exfoliating service,” which was €45 or 135 TL. More about what that included later! After paying, we went our separate ways. I was brought to a large changing room (pictured on the left – picture from the website), with separate locking rooms around the edges. Each of the small rooms had a bed/cot, which I used to keep my clothes and purse. We were provided with the key to our room, a towel, and wooden shoes. I stripped down and brought only my hair tie and key with me (with my towel wrapped around and wooden shoes on!) and walked into the large marble bath room. Upon entering, I was a bit disappointed. There were two women wearing bathing suits, with 3 kids (maybe about 6-8 age range). The kids were running around, splashing water, and being loud (or just being kids). It was a bit frustrating because it was supposed to be a relaxing experience, but maybe that’s what you get when you don’t pay as much! Luckily they didn’t stick around the whole time. 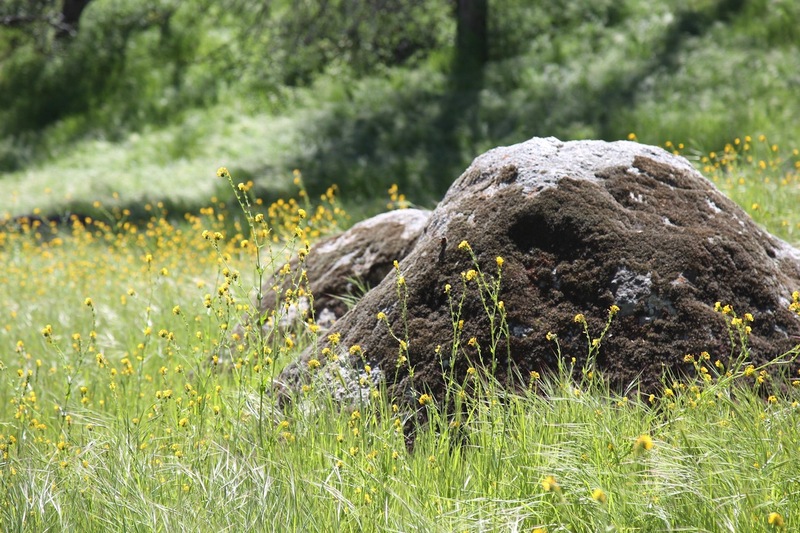 My attendant, Arzeau, told me to lay on the slab, which I did. I put my towel down first and laid face up on top if it, and just tried to relax as best as I could. Another woman came in a few minutes after me and did the same – laid down, waiting for her attendant to come back. I stared at the domed ceiling, which had holes through it shaped like circles and stars, letting sunlight stream through. The room was warm and somewhat steamy, but not as much as I expected. About 15-20 minutes later, Arzeau came back in with a few bowls full of water and started dumping them onto my body. I was still laying face up as she started to scrub me down. She started at my face and worked her way down. I was ready for it to hurt, since I had heard that the attendants are generally pretty rough with the scrubbing, but I was never uncomfortable. Once she was done with the front, Arzeau instructed me to turn around and she scrubbed my back all the way down to the backs of my feet. The last section to scrub was done while sitting up – my armpits, arms, and sides of my torso. Once she was done scrubbing, Arzeau led me over to one of the sinks that surrounded the walls of the room. She quickly rinsed me off, put my towel on the ground, and had me sit on it while she went to get the shampoo. She came back and dumped water all over me until I was soaked, and then lathered up my hair with the shampoo, continuing down to the rest of my upper body. Once that was done, I stood up, was rinsed off once more, and she was done! The entire service took maybe about 15-20 minutes, but as I mentioned above, there were other, more extensive services that were available for purchase. The length of mine was just about right (for me). I was allowed to stay in the bath area, so I went back to the marble slab to relax for another 15 or so minutes, not wanting to take too long because I figured Ryan would be waiting for me. When I exited, I found myself in a room with dry towels, so I grabbed one and dried off before heading back to my locker room (I kept the towel with me, since I would have been naked – which is okay since it was still females only at this point). There were also hair dryers available, but since my hair doesn’t cooperate well without some type of conditioner, I opted to leave it wet. Arzeau came by and handed me a plastic bag with the scrubber she had used on me (a souvenir!) and I thanked her and tipped her 30TL – she was a good attendant and was not pushy at all about being tipped, which I’ve heard can happen. What an experience! I met Ryan at the outdoor cafe where he had already finished his coffee or tea, and had been waiting for me for 30 minutes. His experience wasn’t quite as enjoyable as mine, and he was just ready to get a drink. Would I recommend a turkish bath? Yes, I think if you have the time, it’s a fun and different experience, assuming you are not too uncomfortable to be naked in front of strangers. If we were to do it again, I would have made reservations and gone to a more upscale one, but the one we went to was fine and there were no real issues. The bath was a nice break from a hot day of site seeing and, while it didn’t leave me without wanting a real shower later on, it did leave me feeling refreshed for the evening. After tentative Super Bowl weekend plans fell through, our 3-day weekend was suddenly cleared. And while we love spending long weekends at home to relax and catch up, we’ve been home every weekend this month (albeit with guests) and we’re ready to get out of Bakersfield. We were open to anywhere we could drive or fly (plus driving time to the airport) to in about 5 hours or less. Mexico was promising, but in the end we decided to go north of the border, to Vancouver! Just ordered this book yesterday – Amazon Prime has been very good to us, especially with Sunday deliveries by Amazon! 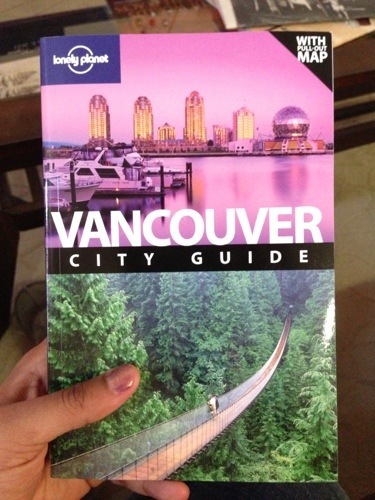 All we’ve done so far is book our flights from LA to Vancouver on Thursday night (returning Sunday). So now the fun begins! We hope to have our hotel booked in the last couple of days, as well as figure out which activities we’re interested in and where we’d like to eat. This is my biggest last minute trip, and it’s something I’ve longed to do. It’s much easier to be spontaneous with our long weekends, so I’m looking forward to seeing how next weekend pans out!